How to adjust your air conditioner? It is often difficult to find the ideal temperature to adjust your air conditioning in summer. This setting, however, guarantees optimal comfort and energy savings. 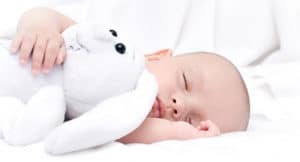 We advise you to adjust your air conditioner to +/- 8 ° C maximum below the outside temperature to avoid a thermal shock while having an optimal comfort. 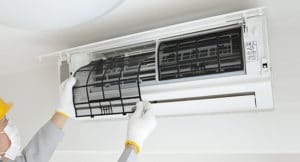 It is necessary to maintain an air conditioner to ensure its proper functioning and performance. Indeed, a dusty device can not be 100% of its capacity, hence the need to clean it regularly. Remove the filters from their location. Dust them with a vacuum cleaner. Clean the filters thoroughly with a cloth and soapy water. Wipe with a cloth and allow to dry before replacing. If the air filters are not in good condition, replace them. 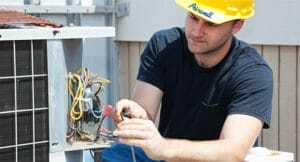 From them depends in part the proper functioning of your air conditioner. How to deal with the heatwave? When the heatwave sets in, there are simple and effective ways to cool the air inside your home. Close shutters to insulate the interior of your home from heat. Open wide in the morning at the coolest hours and make sure to create drafts (beware of doors slamming). Surrounded by greenery, plants bring freshness through evapotranspiration which is the release of water vapor into the atmosphere. Turn off the electrical appliances that are not used because they produce heat, a good habit to take for our planet. Remember to properly adjust your air conditioner. They are trained, receive certificates and offer a preferential guarantee. How to lower your heating bill? 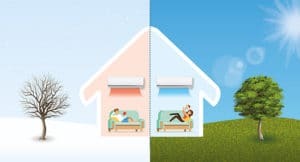 Reversible air conditioning has the specificity of cooling your house in summer and warm it in winter. This is a moderate refresh that lowers the temperature of the habitat guaranteeing you an interior comfort. This solution makes it possible to divide by 3 the heating bill compared to an electric radiator for a better comfort.